How much pressure is on your horse's back? and the surface area on your saddle. you may lose 1/4, 1/2, or even 3/4 of the surface area. 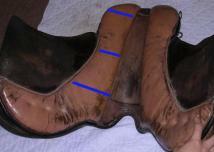 For more on saddle fitting, see Saddle Fitting. For more on weight bearing and weight distribution, see Weight. 2 pounds per square inch. Measure the underside of your saddle to get the length & width. To get the length, measure from the front of the panel/bar to the back of the panel. Measure from the surface, where it touches the horse. To get the width, measure at the front, back, and at the center. Make sure you measure from the edge that touches the horse, not the whole panel. Take the average of the three: for example, if the front is 5", the center is 3", and the back is 4", then use 4". 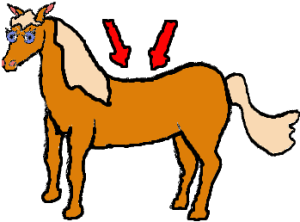 you can find the pressure on your horse's back. The less pressure per square inch, the nicer it feels to the horse. --but the smaller it is, the better.